To see some examples of the practical uses for personalised ID plastic cards, click here. All designs are printed on standard size cards of 86mm X 54mm (credit card size), although other sizes are available for specialised uses. ID cards come in a variety of base colours, onto which your own artwork, photographs, barcodes and security overlays can be printed. A demonstration card of your own design may be available upon request and we also cater for bespoke designs. A self-adhesive padded pin can be utilised for easy attachment to clothing, especially useful for corporate events/everyday office use etc. 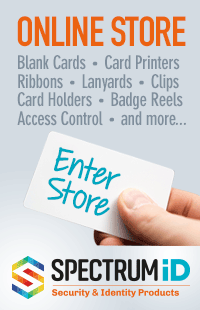 For added security and to ensure a professional finish for your plastic cards, we use the newest security features. Should you require further information on different card styles, card base colours or security features available, please contact us. Based around the concept of using highly defined print lines to create complex designs that are extremely difficult to originate and print. Viewable under magnification, Micro Print can be incorporated into the card and cannot be duplicated by dye sublimination, inkjet or laser printers. UV ink technology allows the printing of images which are only visible when viewed under ultra-violet light. A good covert technology used in passports and banknotes for many years. Protective overlay with built in pattern.